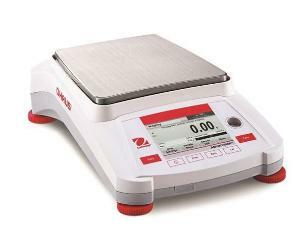 Striking the ideal balance between inventive features and functional, uncomplicated weighing capabilities, the OHAUS Adventurer incorporates all of the applications necessary for routine weighing and measurement activities. Applications include: weighing, parts counting, percent weighing, check weighing, animal/dynamic weighing, totalization/statistics, formulation, density determination, and display hold. Ordering information: Includes AC adapter, RS232, USB host, and USB device.